Alyssa Aquino is an insurance services attorney. As former trial counsel for a global insurance company, she has experience in commercial and personal insurance defense, including construction, premises, environmental and automotive insurance matters. Involved in all phases of litigation, Alyssa works with her clients to ensure they are informed throughout and provide them with solutions tailored for their complex legal issues. Prior to joining Hinshaw, Alyssa was a litigation attorney for a global insurance company. 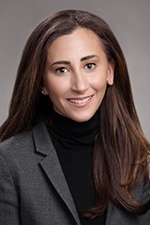 While there, Alyssa's practice focused on insurance defense litigation and counseling the company on areas of the law related to personal and commercial tort matters as well as bad faith allegations. Before beginning her career as an attorney, Alyssa was a tax associate at Deloitte. She also was a legal intern for the Massachusetts Appellate Tax Board and a litigation law clerk for a firm in Boston. Obtained a defense verdict in a jury trial in Massachusetts Superior Court. The defendant slid through a stop sign and cross walk in inclement weather. Plaintiff alleged to have been thrown onto the windshield of the vehicle sustaining head and abdominal injuries as a result of the motor vehicle accident. Within 25 minutes, the jury returned a verdict for the defense. Secured a defense verdict in a jury trial stemming from a motor vehicle accident. Plaintiff alleged permanent impairment of her knee after her vehicle—traveling with the right of way—swerved 100 feet into a 10-foot granite wall to avoid the Defendant. Obtained a defense verdict in a jury trial arising from a rear end car accident out of Superior Court in which the Plaintiff alleged back injuries requiring several series of injections. The Defendant acknowledged contact, but denied causation. The jury agreed. Secured a defense verdict in a jury trial arising from a rear end accident in which the Defendant sneezed immediately prior to contact. The plaintiff alleged neck and back injuries as result of the impact. The jury found no negligence on the Defendant's behalf. Obtained a defense verdict in a jury trial where the Plaintiff entered a rotary with the right of way and was rear-ended by the defendant. The Defendant maintained the Plaintiff stopped abruptly without warning. The defense focused on the impeachability of the Plaintiff who reluctantly admitted on the stand medical records submitted into evidence were actually for a subsequent accident. Obtained a defense verdict in a jury trial where the Plaintiff—who was traveling immediately in front of the Defendant—yielded to oncoming traffic before proceeding on the roadway with the right of way and was rear-ended by the Defendant. The jury returned a verdict for the defendant after a brief deliberation. Secured a defense verdict in a commercial negligence small claims trial in which the Plaintiff lost her diamond wedding ring while staying in a prominent Boston hotel. The defense focused on the meticulous hotel management and lack of negligence at every level of the hotel staff on the date of the loss and throughout the following investigation. Alyssa lives in Melrose, Massachusetts with her family and adorable French Bulldog, Duke.